Dolphin Swim Experience Gain valuable insight and knowledge about dolphins as you swim with them in the Dolphin Swim Experience. 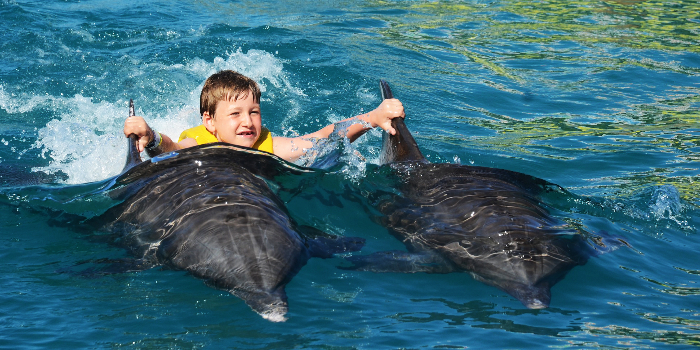 Set in the beautiful location at the Dolphin Adventure Center in Nuevo Vallarta, this program allows you to learn more about dolphins as you swim with them in the water. Before you dive into the water, you will be orientated by our dolphin experts. Ask questions and discover all there is to know about these amazing mammals. You will study dolphin behavior, anatomy, and skills. You will also learn to use the hand-signals and gestures that the trainers use on a daily basis to communicate with these brilliant animals. 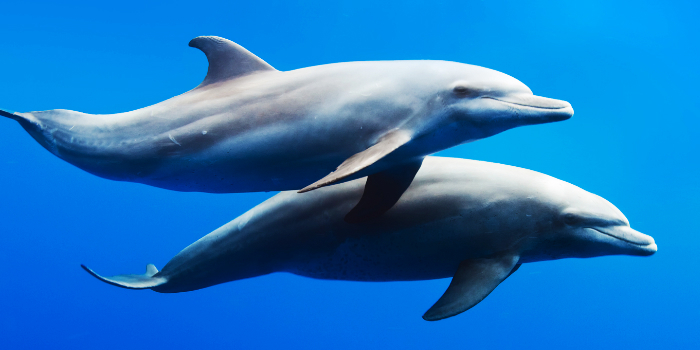 Learn how the dolphins are trained to do their amazing flips, tricks, and skills. Once you wade into the shallow water and begin interacting with the dolphins, you will be in awe of their amazing talents. You will swim with the dolphins in our uniquely designed pool and get to know the dolphins closely as you interact and play. Make memories with your family as you learn more about these fascinating and fun creatures. 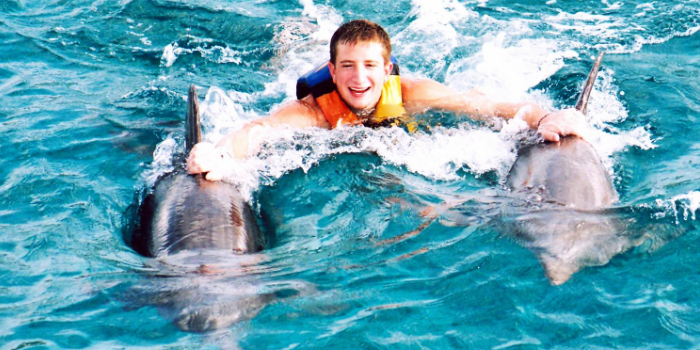 Swimming with dolphins is an incredible experience, but in the Dolphin Swim Experience, you can also ride a dolphin! 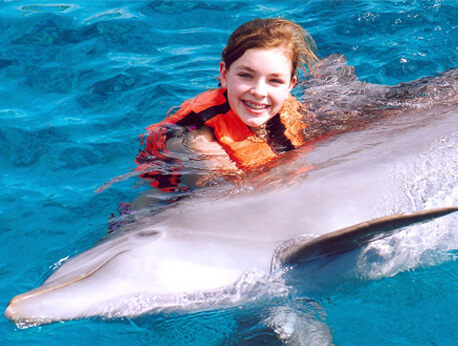 You will also have the special opportunity to hold onto a dolphin’s dorsal fin as the dolphin swims across the pool. 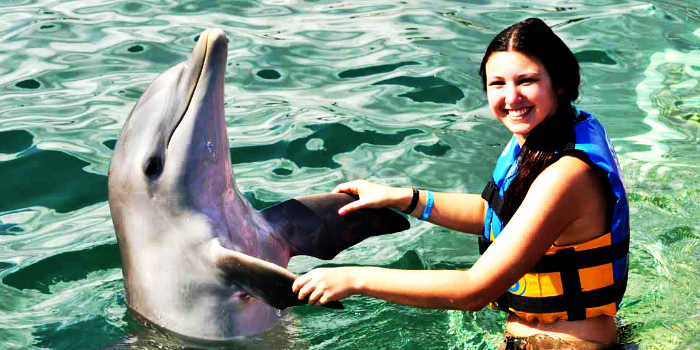 Dolphins are very friendly and enjoy showing their affection to newcomers with hugs and kisses. You won't want to miss this incredible chance to make memories that will last a lifetime! If you not only want to swim with the dolphins, but you also want to learn all there is to know about these beautiful creatures, then consider reserving a Dolphins Swim Experience today! Swimming with the dolphins and learning more about their behavior and training is an adventure that you will never forget.